Linty, what can you tell us about Pomeranz? Nats have a good chance of scoring 5+ tonight? Low to mid 90's fastball, curve and change. Great minor league numbers... so-so pro stats, mainly due to lack of control. It was a bad idea for the Indians to trade him. I am going to listen to this one on the radio while sipping Makers Mark on the back patio. It's been a crap week at work and I need to chillax and listen to some C&D. i always get the rockies road uni combo wrong (they have a ton anyway), so please if you're heading to the game or see it on one of the pregame shows, let me know what hat/jersey combo. thanks. That sounds like a wonderful idea however it's about 98F here and I imagine if I drank more than a shot I'd be blasted out of my mind. The week of and week after my surgery was probably the best weather we've had all summer. Either way, I'll be on the couch downstairs watching the game in HD on my 65" tv. I just wish I could get C&D up here. I am going to listen to this one on the radio while sipping Makers Mark on the back patio. You obviously ain't in the DC area. We must CRUSH these scumbags from Colorado like the cockroaches they are. Anything less than a punishing assthrashing will be considered a failure and will result in Thanos being angry with you. DO WHAT YOU MUST DO NASTY NATS BUT DO NOT FAIL!!!!! I'm gonna miss this one. But on the other hand, I'm gonna be watching the Astros and cooking chorizo tacos and my friend's coming over promising to take care of this minifridge that my parents left 21 Shiner Bocks in because they think Shiner is good. And since she's fresh from England we're gonna reminisce about how England rocks. And eat Lion bars. "This thick candy bar had crisp wafers in the middle, with Rice Krispies above and around the wafer. The innards of Rice Krispies and wafer were held together by caramel, and then the whole thing was coated in chocolate." I am pairing this with Rahr and Sons Ugly Pug. "Ugly Pug is a schwarzbier, or black lager. Unlike most dark beers that are often described as “heavy” or “chewy”, Rahr’s Ugly Pug has a surprisingly light body. Reviewers have been vocal about how happy they are to have a dark beer that’s easy to drink on even the hottest Texas summer days." dude lion bars sound awesome. i'm sure we can cook up a GDT with each player being a type of candy bar or some kind of snack. Your fiance is cool with this plan? It's the weekend here now so I could watch live, but I am off to play golf with my dad, I should get back for the late innings. Your fiancee is cool with this plan? 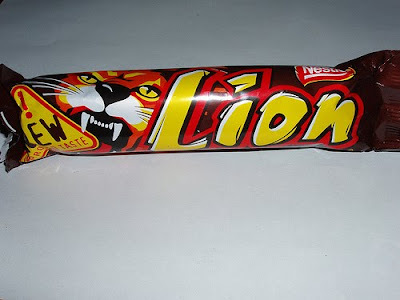 Lion bars amazing. Imagine a gigantic Twix on top of a Milky Way on top of a Nestle Crunch. dude holy crap i want one. Check like import stores and stuff. I got mine at an Arab grocery that for some reason has a giant shelf of European candy. It's made in England but they also have them in countries like Germany and Poland if that helps you ID a grocery that might carry it. Interesting item I heard on the radio today, if the Nats make the playoffs the games will be broadcast on 980, unless the Skins are playing at the same time, in which case the Nats will be on 570. I'm still wound up over last night's game. Ready to take on the Rockies! Strasburg was given an infusion to be ready for tonight. Currently it's 89* and humid. I don't care. The Makers Mark makes everything o.k.